But it couldn’t be, right? I thought that my eyes must have deceived me because I haven’t seen anything like it in a very … very long time. However, when I saw Leonard Floyd come away with the football in the end zone it quickly hit me that this wasn’t a fantasy, this wasn’t a daydream, but rather, this was reality. And on that one play, Bears fans were given a glimpse into what the future holds for Chicago as the ninth overall pick made the play of the season, and it was all due to his effort. Just watch… That’s what happens when a player doesn’t give up on a play. 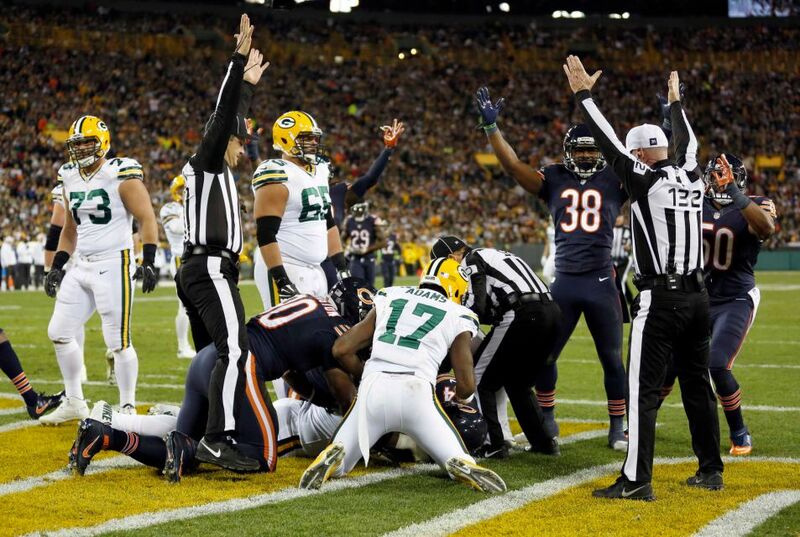 The Chicago Bears have rarely seen plays like this since 2012. In fact, that was the first defensive touchdown in 35 games, which is the equivalent to just over two full seasons. Obviously, it’s a sight for sore eyes. With the injury report becoming denser by the day, the Chicago Bears are being forced to play younger players, which is not necessarily a bad thing. Yes, it’s not translating to wins … yet. But all of this experience that the youth has been handed will only help this team in the future. The Bears are not going to build championship teams around guys like Tracy Porter, Brian Hoyer, Sam Acho, Mitch Unrein. Instead, they will have to develop the young players on the roster like Cre’Von Leblanc, Jonathan Bullard, and of course, Floyd … just to name a few. With Chicago being 1-6 on the year, I can honestly say that the season (in terms of wins) is a lost cause, but the season itself is not. What the Bears need to do is pretty simple. This team currently lacks an identity. Luckily, they have nine games to create one before its all said and done. Chicago needs more leadership. It’s time for the veterans like Jerrell Freeman, Danny Trevathan, and Pernell McPhee to really take the young defensive core, lead by example and set the standard for next season. Same goes for the offense. That unit is struggling, and it’s time for some players to step-up and inspire their teammates to achieve greater success. Before the season’s end, it would be wise for the Bears to find their identity. Then, they have an entire offseason to build upon it. Once an attitude shift starts to happen, it starts a snowball effect and continues to grow upon itself. If that occurs, the Bears could start 2017 with a chip on their shoulder. With playoff hopes out the window, the Chicago Bears should shift their focus from winning to developing. Kyle Long should get his shoulder surgery done and out of the way now, that way he has more time to recover before next season. Even though he played last week, McPhee should remain limited for the rest of the year. Give some of his snaps to Floyd, and let him continue his evolution. Unrein has been ineffective. So, there’s no harm in expanding Bullard’s role too. Chicago should utilize the remainder of the season as an opportunity to scout themselves and find out which pieces belong, and which ones don’t. That gives Ryan Pace ample time to formulate his game plan for the offseason. If the Bears do that, then it’s really OK that the team is currently in shambles as it will only help them moving forward towards a better tomorrow. Hopefully, it’s as promising as Floyd’s outstanding play last night.